Bothell, WA -- AR Modular RF has introduced a new solid-state power amplifier module for the wireless broadband network. 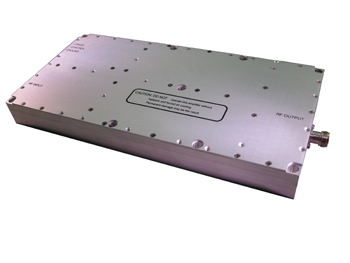 Model KMS2010 (1.75 GHz - 1.85 GHz, 150 watts) is a 52 dBm linear power amplifier with a scaleable gain of 57 dB. It is designed to meet most communication protocols, including various types of OFDM. The module comprises a printed circuit board housed in a machine aluminum enclosure. The amplifier is protected from thermal overload, over-power, over-voltage or wrong voltage polarity as well as having an internal isolator.